A full colour map of the Avon and Droitwich Rings suitable for both waterways and leisure users. 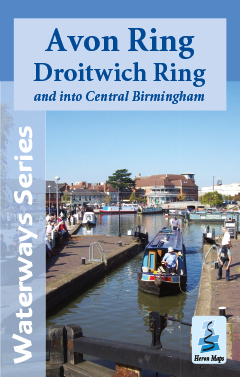 This map gives detailed coverage of the Avon and Droitwich Rings including the whole of the Worcester and Birmingham Canal into the heart of Birmingham, with emphasis on the waterways and information useful and relevant to users of the waterways without neglecting other leisure users. The map detail is complimented by information panels and photographs. The Avon Ring comprises the Stratford-upon-Avon Canal, the River Avon from Stratford to Tewkesbury, the River Severn from Tewkesbury to Worcester and the Worcester and Birmingham Canal from there to King's Norton Junction, the start of the Stratford-upon-Avon Canal. We have shown the full extent of the Worcester and Birmingham on into Birmingham's city centre. Whilst the Droitwich Ring is made up of the Droitwich Barge and Droitwich Junction Canals, the River Severn between Hawford and Diglis on the outskirts of Worcester, and the bottom section of the Worcester and Birmingham between Diglis and Hanbury Junction. This tourist map is at 1:50000 with detailed town plans of Stratford-upon-Avon, Evesham, Droitwich Spa, Worcester, Pershore and Tewkesbury at 1:12500. An additional plan of the heart of Birmingham at 1:10000 is also included. Click here to see the area covered by this map. Includes navigation and historical information, visitor moorings, marinas, boatyards and boat hire centres with contact details, facilities for the boat user, sailing and boat clubs, shops, post offices and distance markers. Information for the tourist includes tourist information centres, places of interest, pubs, nature reserves, parks, churches, national cycle routes, long distance paths, public toilets and caravan and camp sites. The Avon and Droitwich Rings map is available to buy online or by telephone from our business partner, Guidepost. Click on the logo below to visit their store. ©2019 Copyright Phoenix Maps Ltd. Heron Maps is an imprint of Phoenix Maps Ltd.